Aloha Isle Moving offers you the most time-efficient and cost-effective way to store your items and vehicle. We can store your belongings at our secure warehouse or at your location with our On-Site Portable Storage container. Containerized shipments from the U.S. mainland and abroad are vital to Hawaii’s economy. Aloha Isle Moving’s professional trucking and hauling services on Kauai ensure safe and timely delivery of your valuable goods and commodities. Our services include container loading and unloading, hauling of construction materials or other heavy equipment, interisland freight forwarding, and break bulk and delivery. 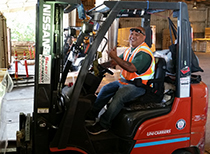 Aloha Isle Moving’s diversified transportation services include warehousing and distribution to businesses and the general public. 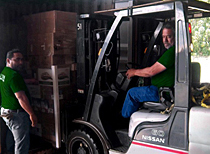 Our staff is highly trained in receiving merchandise, inventory management, segregation, inspection and final delivery.